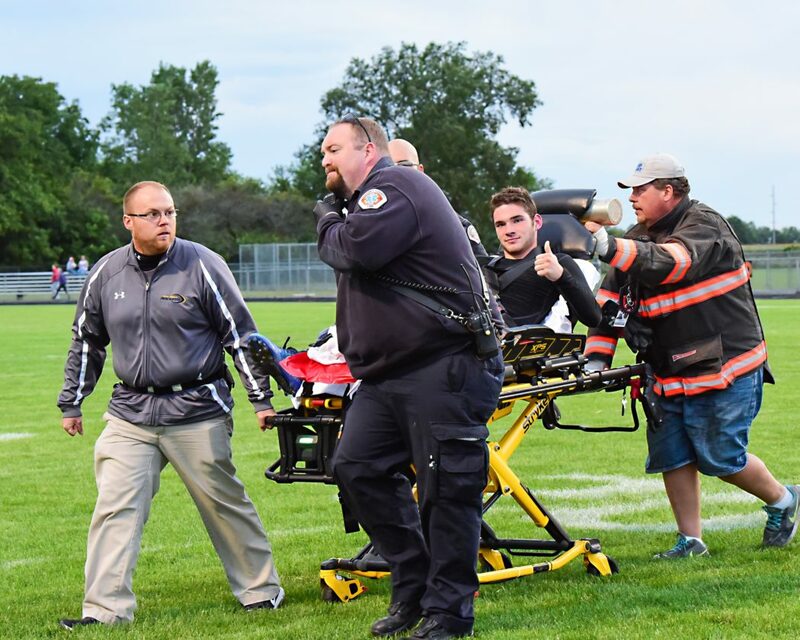 PHOTO COURTESY OF LOUANNE SULLIVAN Lakota football player Jordan White gives a thumbs up as he is taken off the field by medical personnel Sept. 1 in Gibsonburg. KANSAS — There is just a little less than four minutes left in the third quarter when Jordan White pops off the bench and trots to the scorer’s table. It is a Wednesday night and the crowd is not great in size. Lakota finds itself outmatched against a bigger, more athletic North Baltimore and the Raiders go onto lose by 20 points. But, when White checks into the game with 3:20 left in that third quarter, the Lakota crowd, perhaps, is the loudest it has been all night. You see, there was a solid chance that White could or should not even be playing. But, despite not scoring any points or grabbing any rebounds against North Baltimore, White is cherishing the fact that he is even on the floor. “I never even had the thought of skipping my senior basketball season,” White said. Rewind nearly five months to September 1st at Gibsonburg High School. Lakota is rolling against their biggest rival in any sport, 10-0, in the second quarter. White drops back and makes a clutch interception. He returns it about 20 yards before being tackled. That is where everything goes wrong. After a trip to the local hospital and x-rays, White was diagnosed with a dislocated ankle and fractured fibula. The initial thought was that White would miss four-to-six months of action. The senior immediately knew that his football season was over — at least on the field. First-year Lakota football coach Mike Lento knew that there was no doubt that White could be an asset to a team with big things on its mind. But White was not about to let an injury keep him down. Only about 12 hours after one of the most gruesome injuries an athlete can suffer, White was back at the Lakota football field, checking in on his teammates. Lakota scored on the next play after White’s big interception for a commanding 17-0 lead. However, with many thinking about their fallen teammate and a fired up Gibsonburg team, the Golden Bears stormed back to win, 18-17. White then faced the reality of not ever playing high school football again, but knew basketball season was just around the corner. White said there was no way he was going to miss his senior season of basketball too. Lakota basketball coach Ty Ray quickly acknowledged what White meant to everyone. White made his debut on the court on Dec. 15 in a 53-41 road loss to Calvert. That was is just 3 1/2 months removed from his injury. Ray is in an unique position. He has a senior that wants to be on the court, but he knows the long-term health of White is more than important. Ray and Lento echoed what White meant to the team with his natural leadership abilities. Ray noted that White was elected a captain before the season, with the team not knowing if White would ever even see the floor. White had just two receptions for 27 yards and two rushes for 13 yards during the football season — both against Gibsonburg. He also had 11 tackles, 19 return yards, and one interception — an interception that will forever live as White’s final high school football play of his career. White also found himself in a highlight video for Lakota’s fall sports season. White is shown leading the captains out onto the field for the home game against Ridgedale, which Lakota won, 63-6. Lento also had plans to put White on the field one last time in the home finale against Margaretta had Lakota been able to be in victory formation. Unfortunately for White and the Raiders, Margaretta won, 14-7. For now, White is working hard to do what he can for the basketball team. He said he hopes to get some of the screws out of his ankle after basketball season to get motion in his foot before baseball. And all of Lakota is glad White is playing basketball.